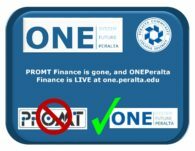 Note that ONEPeralta Finance training is only for faculty, administrators, and staff who use the Finance system (e.g. Requisitions, POs, General Ledger, Budget, Accounting, etc.) For everyone else, no action is required! The HR and Student systems won’t be changing until the fall.